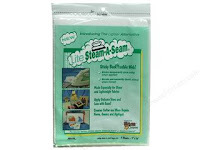 My favorite paper-backed fusible webbing is Steam a Seam Lite , not to be confused with Lite Steam a Seam 2. The number at the end of the second product (Lite 2) indicates that the product has 2 paper sides, and when that paper is removed, the product is a bit sticky, allowing it to be positioned temporarily in place on the background fabric. I do not like this product for 2 reasons: #1...The paper releases too soon, usually while I am trying to cut it out exactly on the lines I drew on the paper. This results in misshapen pieces, and a real struggle trying to reposition the paper when it releases. #2...I don't like the extra stickiness. It really doesn't help with positioning, since I've already marked position lines on my background. If I were designing as I go, this might be an advantage, but for this technique, it gets in the way. 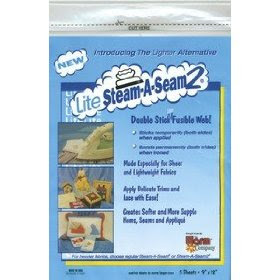 Steam a Seam Lite has only 1 paper side that stays put until you remove it. If you struggle to remove it after cutting out your pieces, you may wish to scratch the paper surface with a pin or Ball Point Awl. 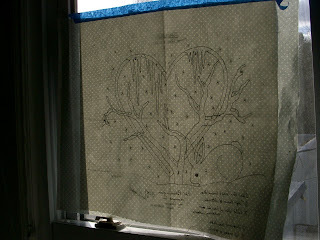 Then fold along the scored line, and the paper will begin to release along the scoring. I also like this product because it will handle the cotton setting on your iron. No need to worry about it melting into your fabric, leaving marks or disappearing. It is also a softer product than others, and you can stitch through it by hand or machine easily, without the adhesive gumming up or resisting your needle. If you can't find this product on your quilt shop's shelves, let me know, and I'll see if we can get it up for sale on my website. 2. Trace the entire design onto an 18" freezer paper square. Fold the square in quarters to help with aligning the pattern with the square and on the background square later. Use an ultra-fine line Sharpie Marker to trace the design. It will bleed through the paper side of the freezer paper and stop at the plastic vapor barrier side. This will be important later. 3. Center and adhere the prepared marking guide to wrong side of the background fabric, using a hot, dry iron. Make sure the plastic shiny side is toward the fabric, paper side is to the iron. You'll know if you get it wrong.....the paper will stick to your iron, not the fabric, and you'll make a bit of a mess of your iron! 4. 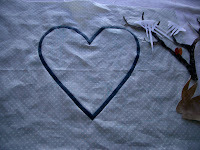 Turn the fabric with right side up, and mark the design with a fabric marking pen or pencil. 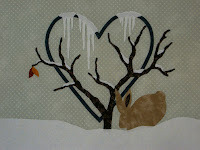 You may need to use a bright window or a light box for this step, if your background fabric is dark or opaque. Please test any marking tool to make sure the marks that it makes do NOT heat set, because you will be using an iron to fuse the appliqué pieces in place later. 5. Remove the freezer paper marking guide, and lay the marked background piece aside. 6. 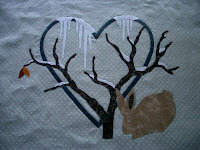 Using the freezer paper marking guide as a pattern, trace appliques onto the paper side of the fusible webbing. 7. Cut the fusible webbing pieces out, leaving at least a 1/8" margin outside the marked lines. 8. Fuse the paper-back fusible pieces to the wrong side of the appropriate fabrics, following manufacturer's instructions for your preferred fusible product. 9. 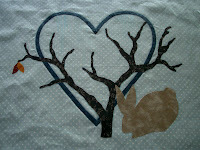 Cut the appliques out exactly on the marked lines. 10. 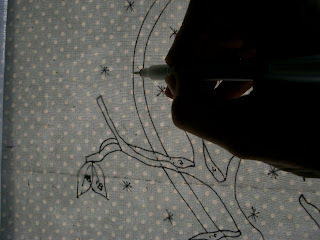 Remove the paper backing, position the appliqués on the background in the order (alphabetical and/or numerical) suggested on the pattern, and fuse the appliqués in place. 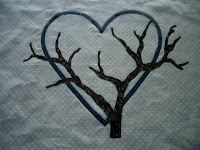 I will try to take some photos tomorrow of how I do this and insert them into this blog, then in a separate blog, I want to show you how I appliqued the bias for the heart in all the blocks. merci de me faire Profiter de ce magnifique patch. Je pense le commencer ce mois ci. Il est trop beau. merci pour ce magnifique patch. Je pense le commençer ce mois de février. Using an online translator, I think Christiane has said: "Thank you for this wonderful block. 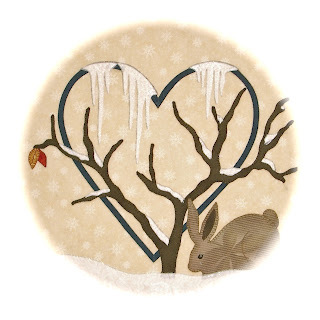 I think the month of February. It is too beautiful. Regards"